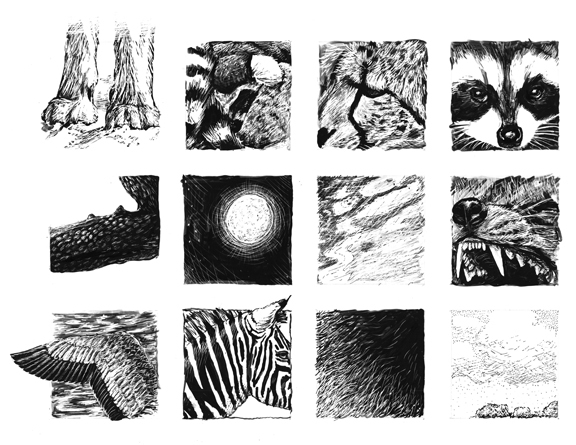 This week I’m going to share one of my favorite mediums: Scratchboard. Not the kind that is already inked, but the one you ink yourself. Unfortunately it isn’t easy to find. (of course, if any readers knows a good place I’d love to know). I use Essdee un-inked scratchboard. I love the un-inked scratchboard because it allows you to create great contrast faster than one where you have to scratch away all the ink to create a white area. Plus, the ink in the already inked variety can chip (especially if it is old). 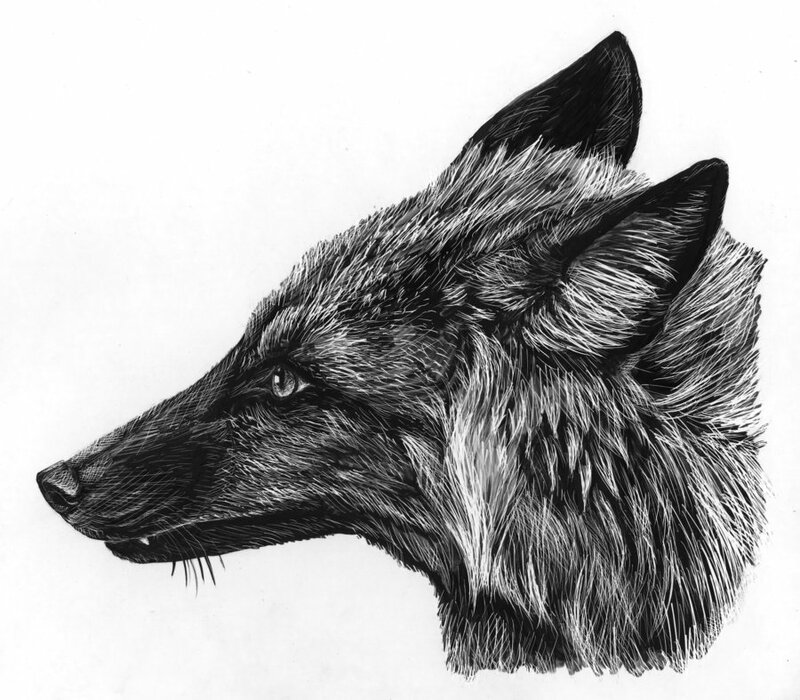 As you can tell from my artwork, I love to illustrate the canine family, and scratchboard is the perfect medium for that. This first one above is one I did to test out different techniques and textures. My favorite is the top left (wolf feet). That was the last one I did (since I’m left handed and did not want to spear the ink, I went from bottom right to top left…) I want to create another illustration using that technique in a future illustration. I actually created this after I did the bottom two images in this post (the fox and wolves). It reminds me of the old wood block illustrations. 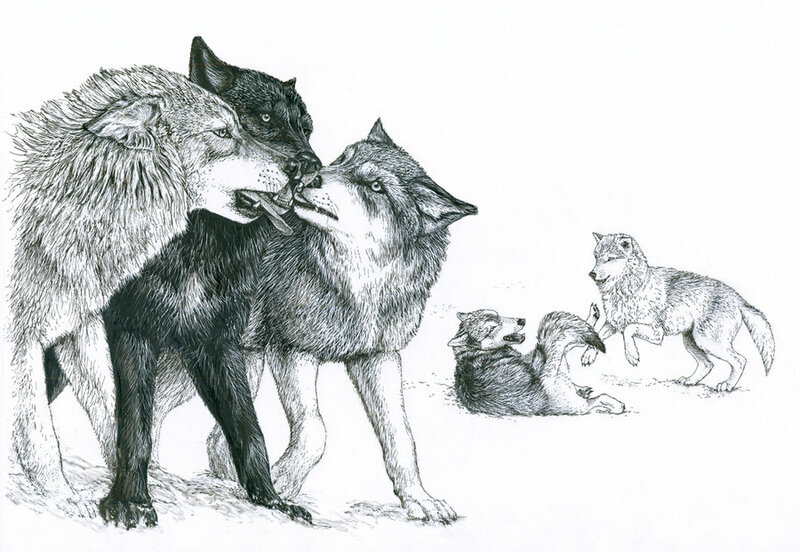 This one is an illustration done to show the common shape shifting animals portrayed in Japanese mythology. Starting with the left we have: a fox, a dog, a cat, a raccoon dog (tanuki) and then a badger. 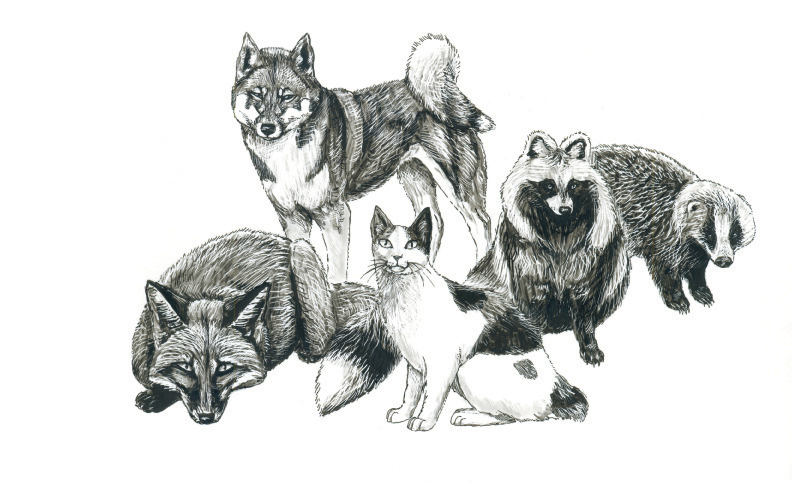 The fox, cat and raccoon dog are the three most common shape shifters in Japanese mythology and the raccoon dog and badger are often confused with each other. I tend to believe that the raccoon dog is the shape shifter in mythology and not the badger, but I did read that the badger is sometimes shown as a shape shifter, as well as the dog, so they are included. After creating the above fox illustration I was excited to draw a wolf illustration. If I used an already inked board then the illusion of a field of snow would not have been possible. The winter scene would not have had the same feel.